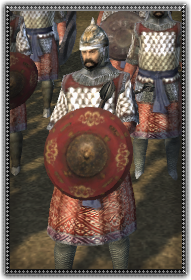 These heavily armoured nobles are usually seen mounted on the battlefield. But when the situation demands it Tawashi warriors dismount and fight hand-to-hand with their enemies, disregarding all odds. Armed with a heavy mace they crush bones and skulls, wrecking armour to sheets and splinters of metal. These warriors will clear hostile walls of any enemy who stands against them.